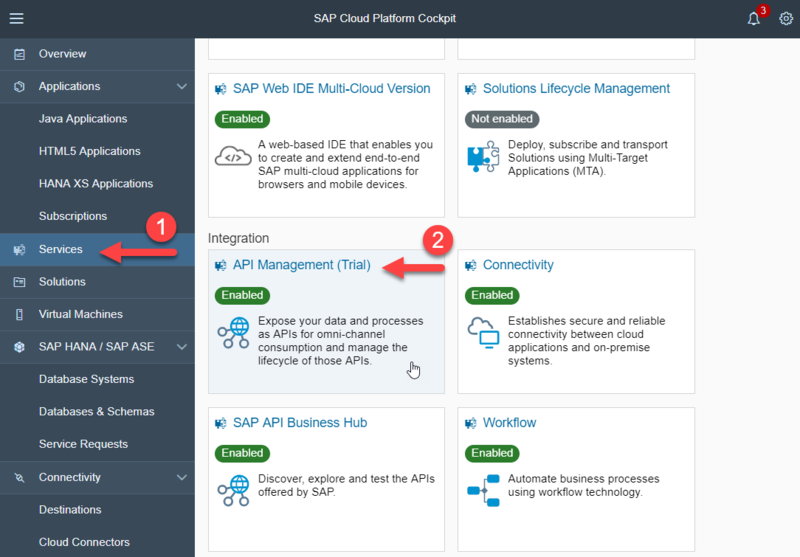 SAP Cloud Platform, API Management offers many out of the box API Security best practices which can be customized based on your enterprise requirements. 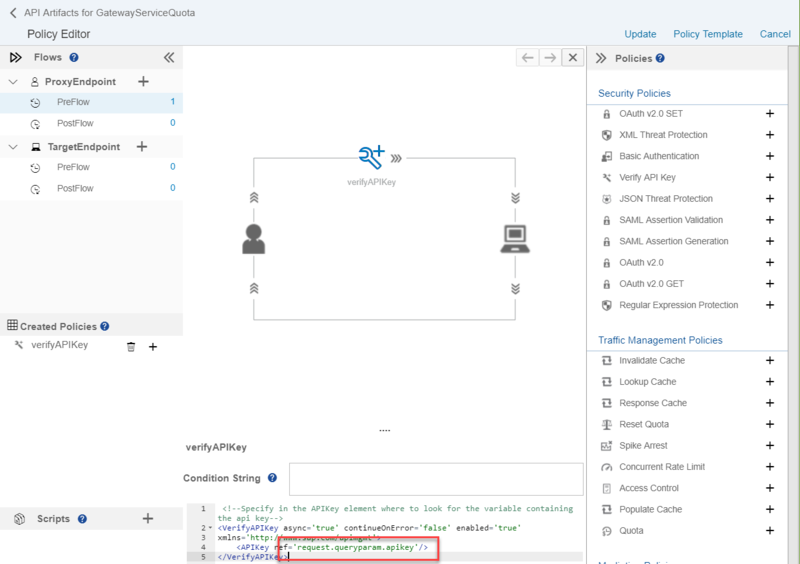 These API Security Best Practices includes security policies for Authentication and Authorization, Traffic Management and many more. 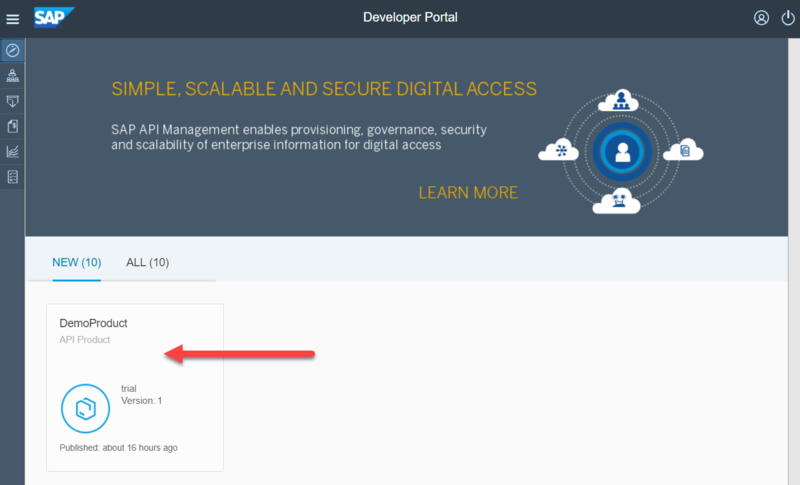 In this blog, we will see how SAP API Management addresses the OWASP Access Control – API Rate limits topic through the Quota policy. Indeed, API Rate limits will defend against denial of service or brute-force attacks. For that you use the Spike Arrest or Concurrent Rate Limit policies. But sometimes APIs are being misued by non-solicited requests, over a longer period of time. To avoid this, you can use mechanisms such as API Keys (see the Anti-Farming section of the OWASP Security Cheat Sheet) and the aforementioned Quota policy. The Quota policy can limit the amount of API calls per application and on a wider time scale hance adressing the misuse of the service. Note that the Blog Entry from Divya Mary covers the scenario in which you create a rate limit on API level, including sending back a 429 HTTP status code in case of violation. In our blog post the main focus is on rate limit per application, ie. API key. More best practices are covered in API Security Best Practices blog series. 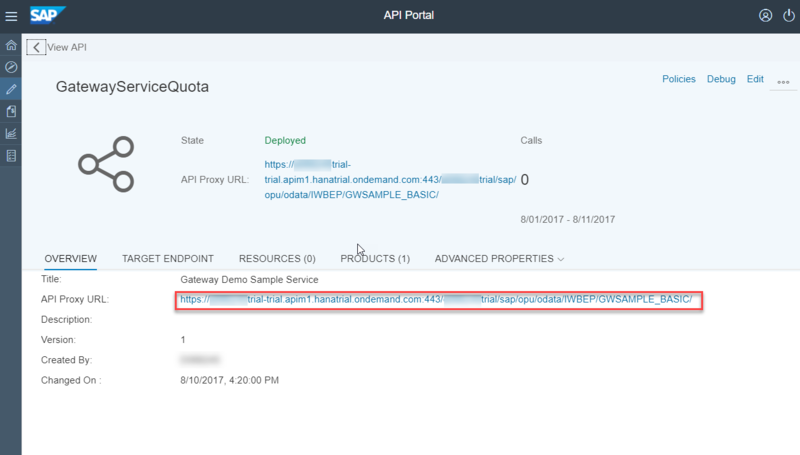 SAP Cloud Platform API Management tenant. 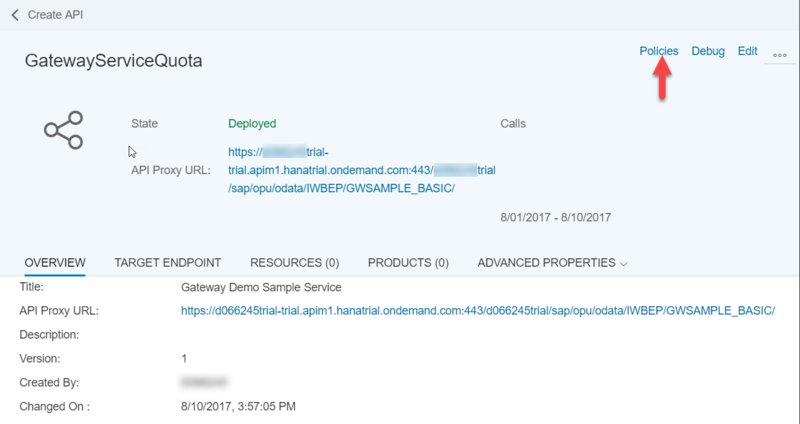 Logon to your SAP Cloud Platform, API Management account (say https://account.hanatrial.ondemand.com/cockpit). 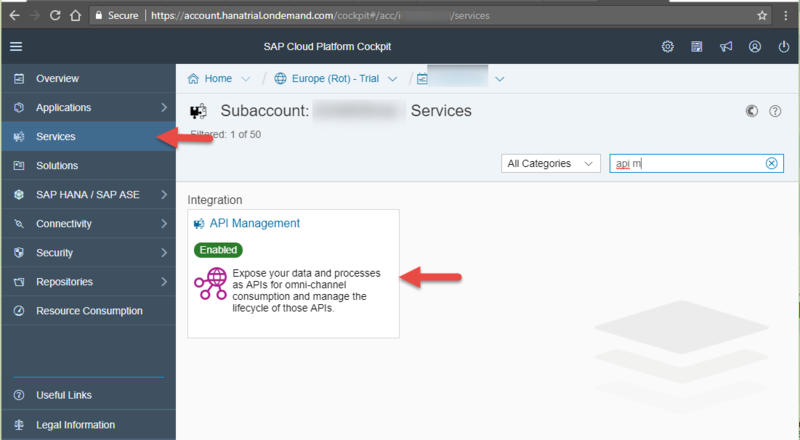 Navigate to the Services tab, search for API Management service tile and click to open SAP API Management service. Click on the link Access API Portal to open API Portal. If you already have an API Proxy to which you would like to apply Rate limit, then you can refer to the section Update an API Proxy. 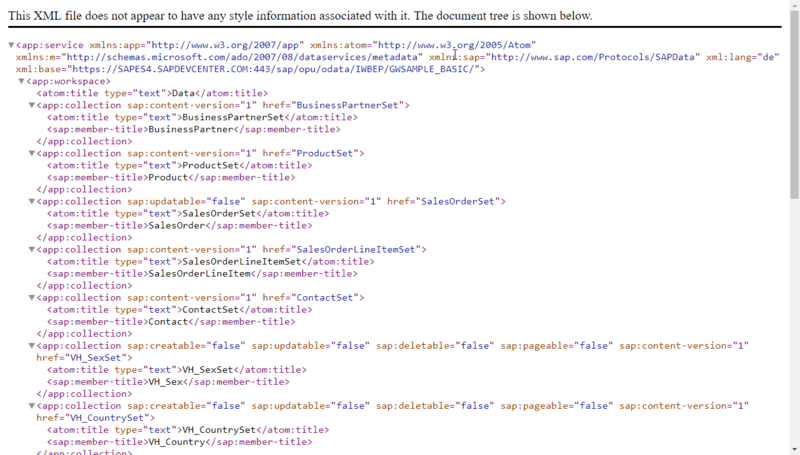 URL: https://sapes4.sapdevcenter.com/sap/opu/odata/IWBEP/GWSAMPLE_BASIC/ (from the SAP Gateway ES4 system). 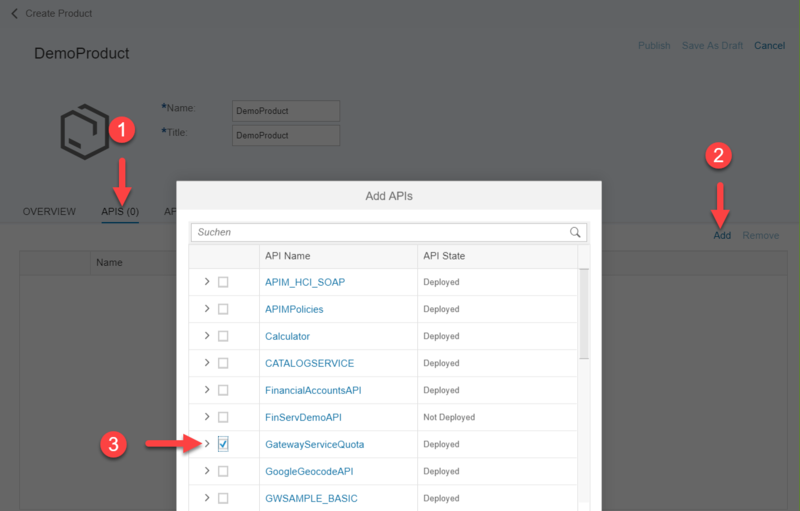 Click on the Save and Deploy button to activate the API Proxy. 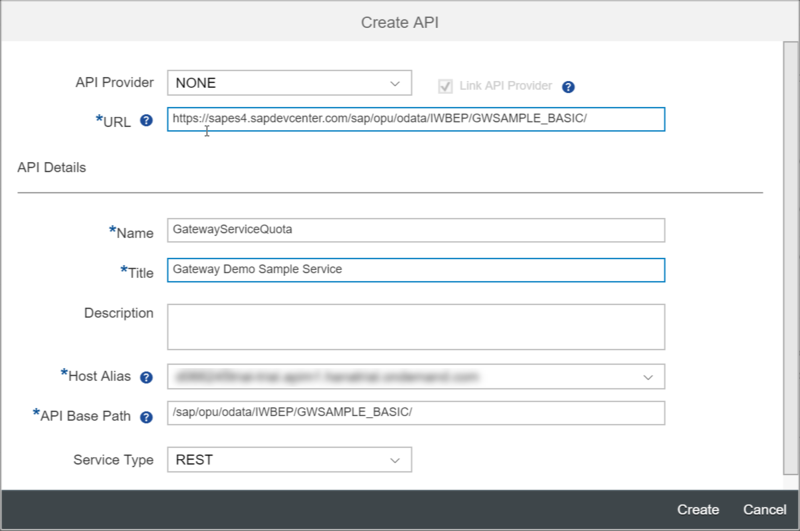 With this we have activated an API Proxy which connects to the SAP Gateway OData API https://sapes4.sapdevcenter.com/sap/opu/odata/IWBEP/GWSAMPLE_BASIC/ and is accessible to any one on the public domain. You may update any existing API proxy using the following steps, or simply continue working on the one created beforehand. Navigate to the Develop menu from the hamburger icon, then select the tab APIs. Now chose the API Proxy to which API Rate Limiting per application should be applied. Before diving into the technical details, let’s take a step back, and do some theory. 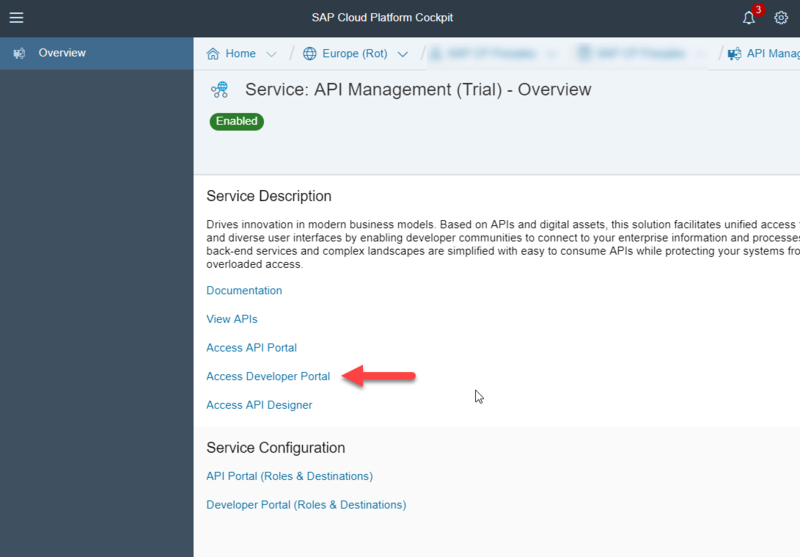 Once you have defined an API Proxy, you can publish it on the SAP API Management Developer Portal. This is done through the concept of “API Products“, which is a bundle of APIs that you want to deliver to your developers. These API Products can be subscribed to on a self-service basis, in which case the developers gets an API Key for his application. This key needs to be sent for each API call the application makes. Now by adding a “Verify API Key” policy to our API Provider, we will not only make sure the caller is a legitimate application, but we will also be able to enforce the quota for every application. This will be done in a second step through the Quota policy. Herunder are the technical details on how to set this mechanism up. In your previously created API Proxy, or in any other proxy you would like to implement the Quota feature, click on the Policies link. 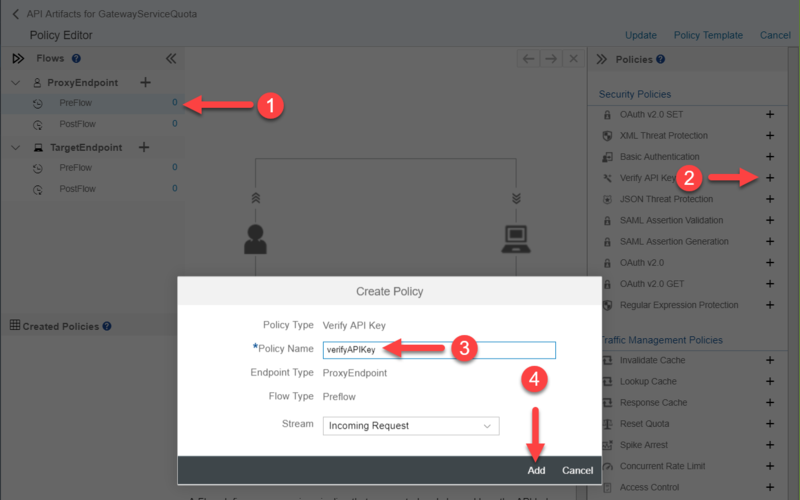 Within the policy editor, click on Edit, and then add the Verify API Key policy to the ProxyEndpoint pre-flow (select it before adding the Verify API Key policy). Name it “VerifyAPIKey”, make sure to have the Incoming Request flow selected and click Add. Click on the verifyAPIKey policy and modify its configuration, ie. the location from where the API key should be read. In our case we will read it from the query parameters. 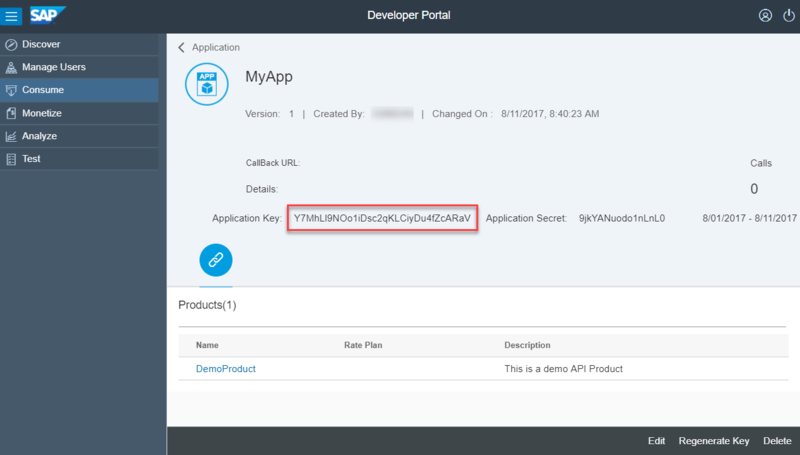 In order to get an API Key, used to link an application to an API, we need to create an API Product, which will in turn be subscribed to by a developer in the Developer Portal. This is what we’ll do in the next steps. 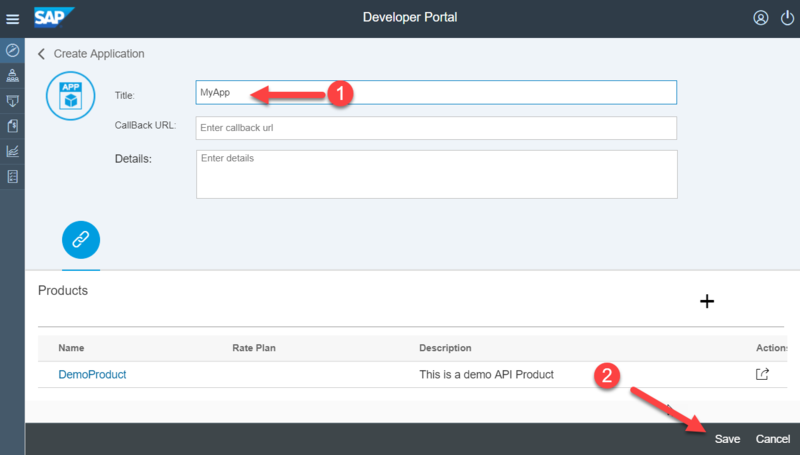 In the API Portal, click on the Develop button on the left side menu. Click on the Products link and then on Create. Name the API product as you want, and set the quota to 10 requests per 1 Minute. Click on the APIS link and add the API we have modified above and click on OK.
Now click on Publish, and the API Product is available through the Developer Portal. In the next step, we will creat an application that will use that API Product, by having a Developer subscribing to it, and getting an API Key. As discussed above, before testing our API Proxy, we will need an API Key. This is done by the developer building an application, through the Developer Portal. Click on the link Access Developer Portal to open API Portal. 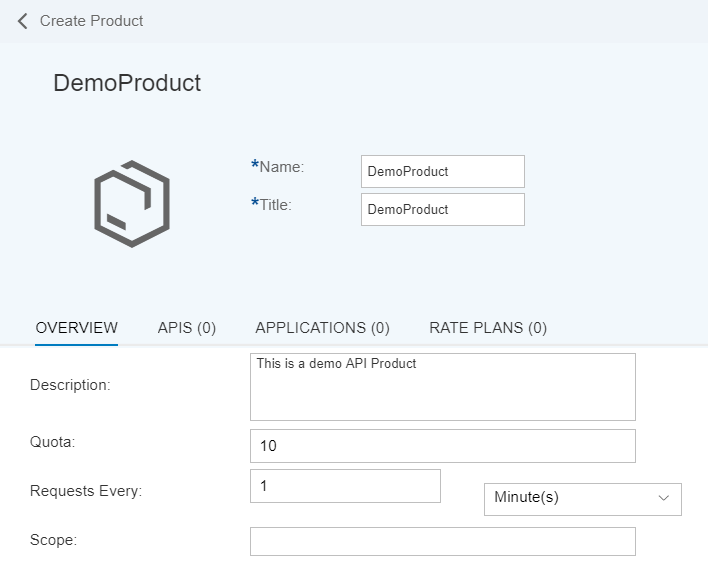 As an application Developer, you can now browse through the APIs. Click on the DemoProduct tile. Now click on the Subscribe button and chose New Application. 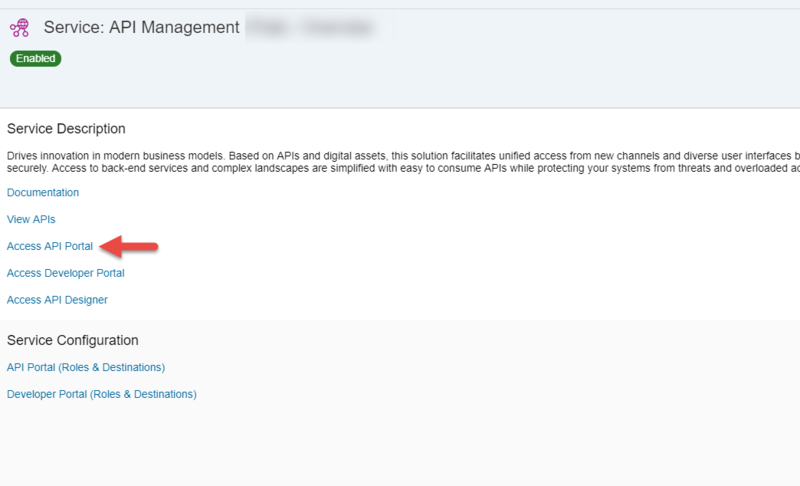 You are taken back to the DemoProduct screen, but you want to see the API Key of your new appilcation. 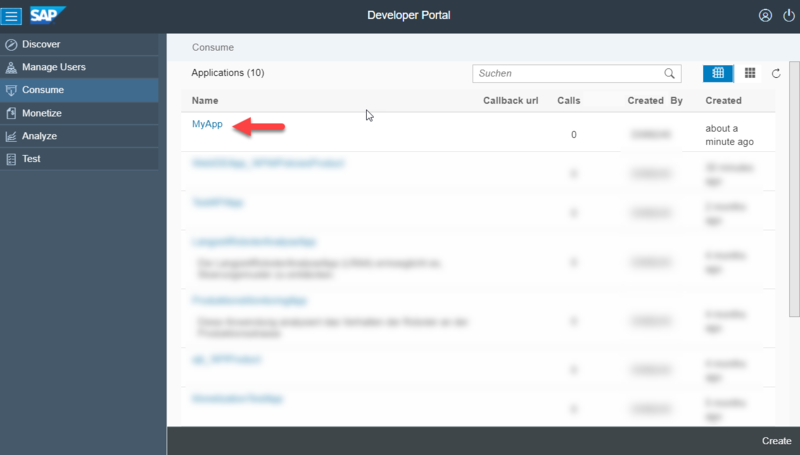 To do so, click on the Consume icon on the left side menu, and select the MyApp application. You can now see the Application key, aka. API key you can use to call the APIs available in the API product of the application. Before going any further, let’s test our API Proxy with the key. Remember: we are verifying the API key coming in as query parameter. Hence we can use a simple browser to do the test. Obviouls, we could also use tools such as PostMan or cUrl but this is out of scope. First, let’s get the URL of our API Proxy. Go back to your API Portal and select the GatewayServiceQuota proxy. From there, you can see the URL used to access it. Click on the URL, which should open a browser. Now add that API Key as parameter to your API Proxy URL, and execute the request. Note that you will need to provide your credentials required by the Demo ES4 system when running the request for the first time. Now it is time to define the rate limit per application, using the Quota policy. 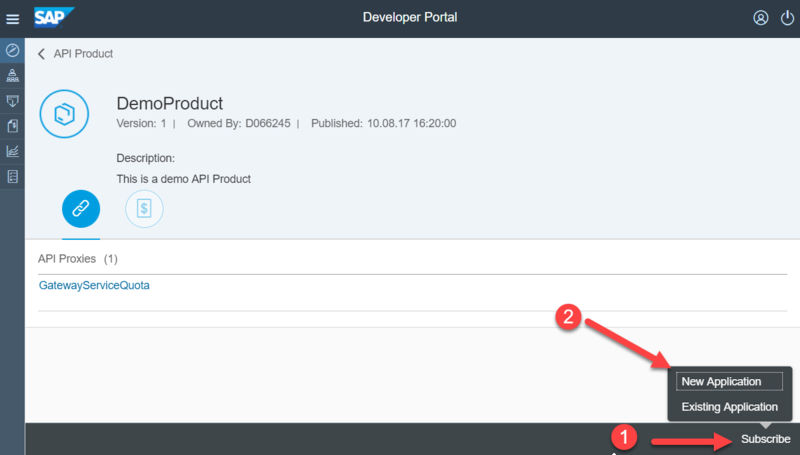 Navigate back to your API Portal, locate the API Proxy you have been working on so far, and open the Policy Editor. Switch to Edit mode, click on the PreFlow flow on the left, and add the quota policy to the incoming request. Name the policy “enforceQuota” and click on Add. The default counting behavior of the Quota policy is not bound to a specific application: any call is being counted, and when the quota is reached, the API proxy won’t let any request go through anymore. After having executed the VerifyAPIKey policy, we can access general flow variables within our API Proxy, that contain specific information about the application, it’s developer, etc..
Identifier identifies the name of the Quota used to count the api calls. Setting its to client_id makes it unique to the application, since we have a 1 to 1 relationship between application and api key (also called client_id). Allow sets the rate limit. In our case it is dynamic, retrieved from the API product through the variable apiproduct.developer.quota.limit. Note that we set a default of 2 through the “count” property. Interval sets the time interval in which the number of calls is counted . It is also dynamic, retrieved from the API product. TimeUnit defines the “time unit” such as minute, hour or day. This is also dynamically retrieved from the API product. Also note that the Quota policy can “weigh” requests. In this way, you can specify that certain HTTP methods can account differently in the Quota. For instance POST and PU would count for 2, whereas GET for 1. Note that the weight can be adapted to any use case, not only to match the HTTP method. Now that all the pieces are in place, it is time to test our API Proxy. Just as you did before, open a browser and use the URL of your proxy, followed by the API Key of the application using the API Product. Note that this will result in a HTTP 500 error, which you may want to replace with a 429 error as explained in Divya’s post or in my previous post. Hey Sven . Is API Management service available for CF Trial Landsacep? as far as I know, we are working on it, but it is not yet available. I guess our Product Management will issue a Tweet or a SAP Blog Post once it is available.